This Irish angel figurine features a Celtic knot and shamrock gown. 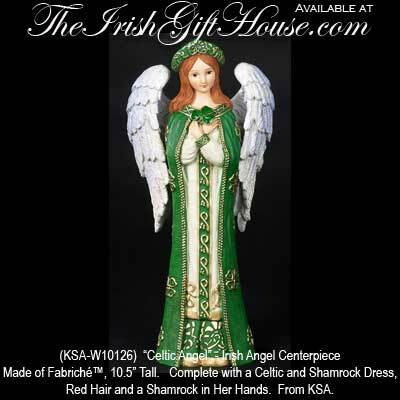 This Irish angel centerpiece makes a great Christmas decoration and may be displayed all year long. The Irish angel is complete with a Celtic knot and shamrock dress, red hair and a shamrocks in her hands. This Celtic angel is made of Fabriché™ and stands 10.5” tall. From Kurt S. Adler.